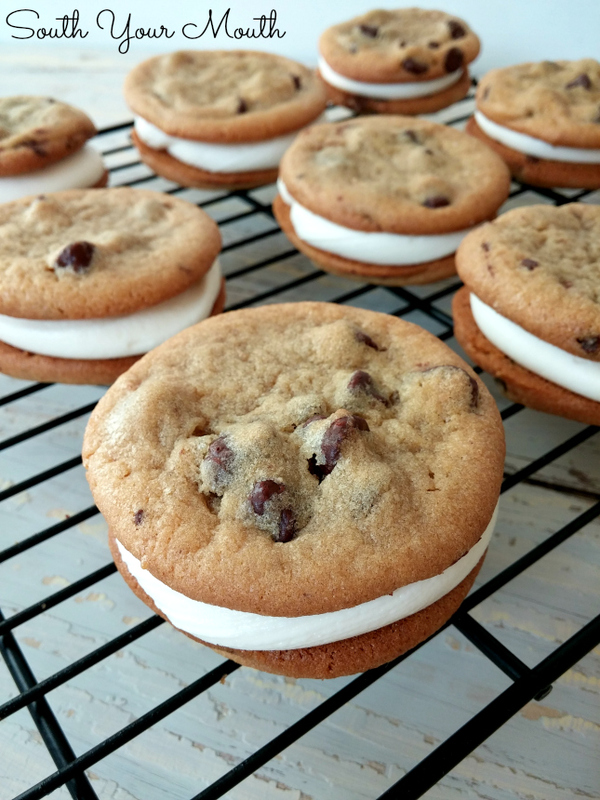 Two chocolate chip cookies stuffed with a no-fail marshmallow buttercream frosting made with marshmallow creme or "fluff". So, remember when I posted my No-Fail Vanilla Buttercream recipe? I talked about how hard it is to accurately measure dry goods (or measure exactly like the recipe creator) so I developed my recipe around a 1-pound box of powdered sugar so there’s no way to mess it up? And all you have to do is dump the whole box in the mixer? Well, I decided I wanted to make a marshmallow cream frosting this weekend and employed the same technique. I used one whole tub of marshmallow cream and one whole box of powdered sugar (no measuring!) and worked from there to arrive and a perfect marshmallow buttercream frosting! 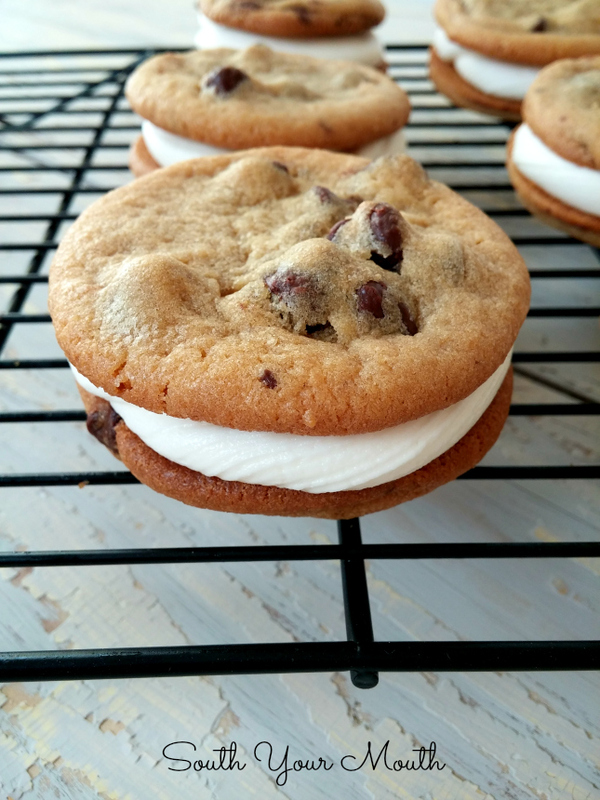 I wanted to make cookie sandwiches but knew I’d need something with a little more body and elasticity than a traditional buttercream to physically support the cookies and withstand a bite without shooting out the sides of the sammich. And I wanted something slightly less toothache-y sweet since the cookies would be plenty sweet too. Yes, I know I put way more thought into recipes than the average bear. And that’s probably weird. I love this frosting. Like, I love it, love it. I can’t wait to make this for cupcakes! It’s beautiful and pipes like a dream! I don’t think it tastes like marshmallows, it’s just this fluffy, light, crisp-white frosting that is insanely delicious. I kinda wanted to rub some on my face. Flip half of the cookies upside down. Pipe frosting onto the back of the cookies going about 1/8" from the edge. Place the remaining cookies on top of the frosting to make cookie sandwiches. Press down slightly on the cookies until the frosting spreads to the edge of the cookies. 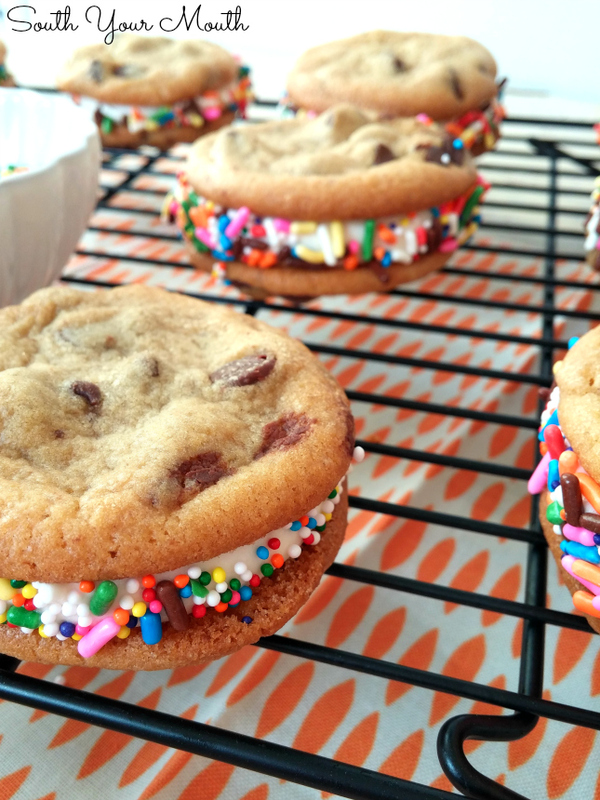 Roll the edges of the cookie sandwiches in sprinkles if desired. Store in an air-tight container at room temperature for up to one week. 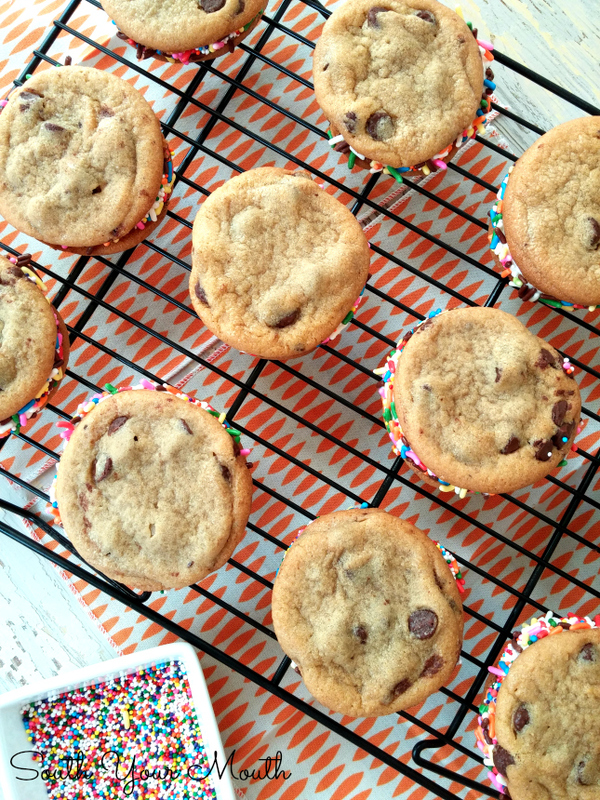 *Here's a great recipe for Chocolate Chip Cookies or you could change it up and make Peanut Butter Cookies too! Note: I didn't bother with a piping bag and fancy tip - I just loaded up a zip-top bag and snipped a hole in the corner. And when I was done I threw the bag in the trash. Boom. Done. And I might have shot one last blast of icing straight into my mouth before I tossed the bag. Whip marshmallow cream, butter and vanilla extract on medium speed with an electric mixer until well combined and fluffy (about 2 minutes). Add 2 teaspoons milk or cream and powdered sugar then continue mixing on medium speed until smooth. Add more milk or cream, 1/2 teaspoon at a time, if necessary until you reach your desired consistency. Yields enough for 24 cookie sandwiches, 24 normal cupcakes (or 16 heavily frosted ones) or one 13x9 cake. If you’re making a layered cake, double the recipe to ensure you have enough. How long does this recipe last, if you don't use it all at onetime?? Up to one week stored in an airtight container at room temperature. This looks and sounds so delicious...you said it pipes like a dream, and I was wondering if it would be good for a rose cake? Thanks! I've never iced a rose cake so I can't speak from experience but it pipes very neat and clean so I would think it would be great! Used this a filling for a dark chocolate cookie sandwich (think whoopie pie only more brownie like) and it was Uh..Maa..Zing! Looks delicious! I can't wait to try it. Thanks for sharing!